What If…We Could Prevent Storms From Occurring? Have you ever heard of weather modification? Has anyone told you (or have you thought) that we would be doing society a favor if we could figure out how to prevent destructive storms such as hurricanes and blizzards from happening? What do you think the earth would be like if we didn’t have these storms? Due to the earth’s tilt, the sun heats the earth unevenly. 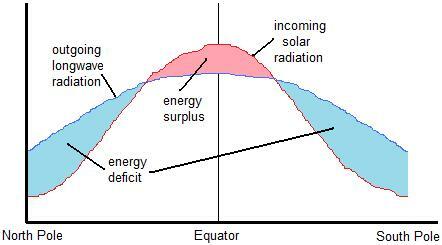 The tropics receive more direct solar radiation than the poles. Some of this radiation is absorbed by the earth, which subsequently emits longwave radiation back to space. The tropics, as you might guess, emit more radiation than the poles. Now, the tropics receive more solar radiation than is emitted by the earth at the tropics…but the poles emit more radiation than they receive. This means the tropics have a net surplus of radiation and the poles have a net deficit of radiation (see figure, below). Left unchecked, this radiation imbalance would result in the tropics growing increasing hotter, and the poles growing increasing colder! Now enter fronts, winds, high and low pressure systems, and smaller-scale thunderstorms. Whenever something is out of balance, the earth (or atmosphere) tries to balance it out somehow. Thus, warm air must be transported towards the poles and cold air must be transported towards the tropics. An extratropical cyclone (a low-pressure system in the mid-latitudes) and its associated cold and warm fronts forms to restore equilibrium to the earth’s temperature differential. Take a look at the red “L” off the coast of North Carolina. This indicates the center of the low pressure system responsible for the ongoing blizzard in the Northeast. Lows spin counter-clockwise in the northern hemisphere (opposite in the southern hemisphere), thus there are north and west winds that are coming around and pushing a cold front (blue line with triangles) southeastward. Note many temperatures (indicated by red numbers) are in the 30s behind the front. South-southeast winds are wrapping around the eastern side of the low, behind a warm front (red line with semi-circles) lifting northwestward. Note the temperatures behind the warm front are in the mid-60s. Note also that these large extratropical cyclones usually have smaller storms that form along the fronts and/or around the low (e.g., snowstorms and/or thunderstorms). These smaller-scale storms are also attempting to balance an aspect of the environment that is out of balance. Hurricanes are another animal, but are similarly large low-pressure systems (minus the fronts) that help to balance things out. All that to say that if we did not have weather, including occasionally severe weather, we might be in even more trouble. There is no way to stop the earth from trying to continually balance itself, but if somehow we could, the earth might soon be unlivable. 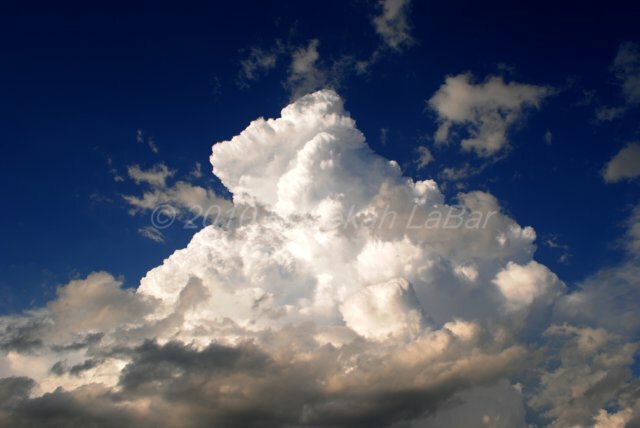 What do you think about weather modification or what the earth would be like without severe weather?